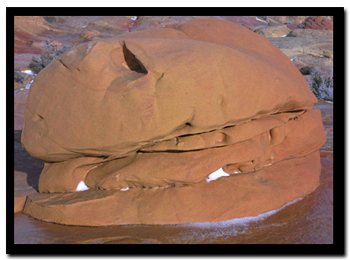 Paria Canyon contains the spectacular Coyote Buttes Special Management Area. The notorious sandstone buttes sit at the bottom of Utah's Grand Staircase-Escalante National Monument and the upper section of Arizona's Paria Canyon -Vermillion Cliffs Wilderness area. Day hike: Yes. No overnight camping is allowed inside the permit area. Trail Distance: 5.5 miles to the Wave and back. 8 miles round trip from the Wire Pass parking lot to the Wave, Top Rock Arch, alcove, Melody Arch, dinosaur tracks and back. Average hiking time: 6 hours round-trip to the Wave. 8 hours for the Wave, arches, alcove and dinosaur tracks. Equipment: Sticky, rubber hiking shoes. A least a gallon of water per person, especially in the hot summer months. A GPS. The BLM supplies a good map to the Wave with each permit. Optional Map: USGS 7.5' Topographical Quads - Arizona-Pine Hollow Canyon and Arizona-Coyote Buttes. Difficulty: Moderate to the Wave and dinosaur tracks. Third class scrambling to the arches and alcove. Good navigation skills are required. Sun Exposure: Full sun. Dark red rock and sand reflect the sun, amplifying the heat. Permits: From mid-March to mid-November permits will be issued at the Paria Contact Station. From mid-November to mid-March, the Paria Contact Station is closed and permits are issued at the Kanab Field Office. Ten walk-in hikers are allowed and ten daily hikers will be selected through the lottery via online or mail application. With the online/mail permit system you choose three possible dates and submit the request along with a non-refundable fee. Reservations can be made four months in advance. Once received, properly submitted applications will be entered into a computer and then at the first of each month the requested dates will be randomly drawn. If one of the dates you chose is selected, you will be notified. If you opt to use that date, then a permit will be issued for the number of people entered on the original application. The submitted fee will be applied to the total permit cost. Trail Conditions: The start of the trail is uphill and sandy, but most of the hike is over rock. Trailhead: Wire Pass - Located 35 miles west of Page, Arizona and 40 miles east of Kanab, Utah. Best Season: Spring and Fall. It's hot in the summer. When the weather cooperates, this is a good winter hike. Restrooms: Vault toilet at the Wire Pass Trailhead. Wire Pass Trailhead - From Kanab, drive 40 miles east on Highway 89. 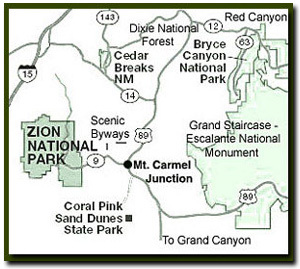 The turn onto House Rock Road is located on the south side of the road (right side driving from Kanab). It is located between mile markers 25 and 26, before a sweeping left hand curve in the road, prior to a guard rail protecting the curve. House Rock Road soon becomes dirt and is impassible if wet. Continue 8.3 miles to the Wire Pass Trailhead parking lot, located on the right side of the road. Display your parking permit in your windshield. The Wave Route - Walk across the road, to the east, and locate the hikers path. Sign in at the register box and read pertinent information. Soon the path drops into a wash. Walk down the wash (east) for .6 miles. Look for the signed path of use on the right side, above the wash, exiting Wire Pass Wash. Hiking becomes steep for the next few hundred yards, as an old 4WD road is followed to the top of the ridge and to the second register box. Once again, stop and sign in at the register. Shortly after leaving the register box, there may be an indication that the trail splits. Taking the left-hand fork is easier traveling. It continues east and passes large rock domes on the flats below. After passing the domes, the trail soon drops into a wash. It will be necessary to cross the wash and approach the slickrock ridge to the east of the wash. Continue to the east, up and over the slickrock ridge. Once on top, work down the east side (backside) of the ridge, but start bearing to the south (hikers right), and stay as high as it is comfortable, on the steep slopes of the ridge on the right. Vertical Crack or Notch - Looking south, a large slickrock mountain comes into view. There is a long, vertical crack in the mountain. This crack becomes the landmark to steer toward for the next mile. The Wave is located beneath the mountain with the crack. On the way, remember to stay as high as comfort allows, hugging the sandstone slabs on hikers right. Twin Buttes - As travel continues south, two large buttes come into view. These are called the Twin Buttes, and come almost halfway through the hike. They are easier passed by walking up the slickrock bowl and going around the right side. A wash is encountered .5 miles after rounding the Twin Buttes. Multi-colored Domes - Peer across the wash and notice the multicolored domes on the opposite side of the wash. These and the less obvious sandstone formations to the right are the Wave. Walk down into the wash, locate the dead juniper tree and the sandy path that leads up to the Wave. 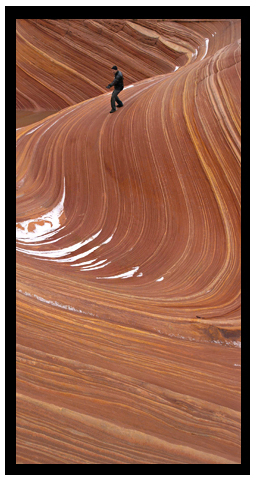 The Wave - The area called Top Rock, is a collection of white Navajo sandstone formations. 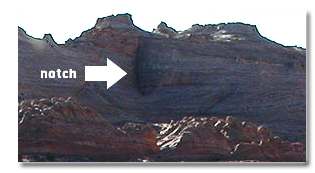 The south end of Top Rock divides North and South Coyote Buttes. The Wave is a chasm located on the northwest edge of Top Rock. 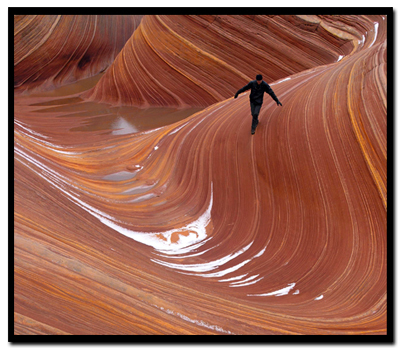 The Wave is about .04 miles south of the Arizona and Utah state line. Top Arch - Most hikers never venture this far past the Wave. This section involves third class scrambling. 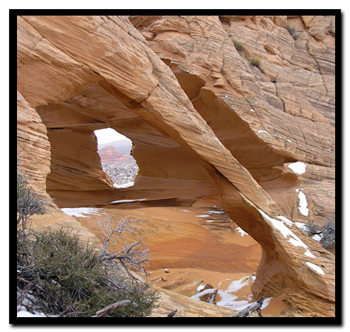 Only those experienced in slickrock scrambling should attempt to go to the arch and beyond. Continue up the sandstone, heading toward the right. Locate the arch at the top of the mountain. Find the easiest path to travel up the steep slickrock. The arch is approached from the backside of the mountain. From the arch, the red cones of South Coyote Butte are visible. Alcove - This hidden treasure is rarely found by hikers. To locate the alcove, return the way you approached the arch. This time stay to the left, hiking over crossbedded sandstone. In the alcove, fine grains of sand have been tossed and turned, wielded by wind, leaving a sculptured creation carefully piled in its bowels. Melody Arch and Grotto - Window - From the alcove, scramble up and left of the alcove to attain the top. Once on top, travel southeast, following the maze of ridges and desert tanks, staying as high as possible. Steer toward the eastern edge of the cap rock. Soon a chasm appears in front. Look down and into the grotto that contains the window and Melody Arch. Backtrack far enough to find an easy route down into one of the tanks, scramble out the backside and slide down into the Melody Arch Grotto. Best Trail Features - The Wave is a popular subject for nature photography, but its not an end to a hike. The vast area has many features to explore. Directions from the Wave: The small reptile tracks are on the other side of the wash, opposite of the Wave. To locate them, cross back over the wash and travel up to the level ground on the north side of the wash. Rather than retracing the return path back to Wire Pass parking, hike to the west. Stay against the steep slickrock mountain, as high as possible. The Wave can actually be seen from the tracks. The GPS coordinates given are to one track. Look around to locate many more, within 100 yards. Many of the tracks are found at the base of the steep slickrock slab to the north, and are in pinkish colored rock, just before the slabs become seemingly impossible to ascend. The footprints appear to be from small bipedal dinosaurs, most likely Grallator (Megapnosaurus) and Anomoepus. Stateline Campground - between Arizona and Utah. It's 10-miles to the Stateline Campground from US Highway 89. There are only 4 spots, so if you want to camp get a spot early. It's first come first use. Two of the camp sights are in Utah and two are in Arizona. There is no water, but there are vault toilets.